The design was created in one day and printed first as a street poster. It was then more widely distributed—both as a digital image and other paraphernalia—during the 2008 election season, initially independently but with the approval of the official Obama campaign. The image became one of the most widely recognized symbols of Obama's campaign message, spawning many variations and imitations, including some commissioned by the Obama campaign. This led The Guardian's Laura Barton to proclaim that the image "acquired the kind of instant recognition of Jim Fitzpatrick's Che Guevara poster, and is surely set to grace T-shirts, coffee mugs and the walls of student bedrooms in the years to come." In January 2009, after Obama had won the election, Fairey's mixed-media stenciled portrait version of the image was acquired by the Smithsonian Institution for its National Portrait Gallery. Later in January 2009, the photograph on which Fairey based the poster was revealed: a June 2006 shot by former Associated Press freelance photographer Mannie Garcia. In response to claims by the Associated Press for compensation, Fairey sued for a declaratory judgment that his poster was a fair use of the original photograph. The parties settled out of court in January 2011, with details of the settlement remaining confidential. On February 29, 2012, Fairey pleaded guilty in a New York federal court to destroying and fabricating documents during his legal battle with the Associated Press. Fairey had sued the news service in 2008 after it claimed that the famous poster was based on one of its photos. Fairey claimed that he used a different photograph for the poster. But he admitted that, in fact, he was wrong and tried to hide the error by destroying documents and manufacturing others, which is the source of the one count of criminal contempt to which he pleaded guilty. In September, Fairey was sentenced to two years of probation, 300 hours of community service, and a fine of $25,000. In 2009 Fairey's Obama portrait was featured in the book Art For Obama: Designing Manifest Hope and the Campaign for Change which Fairey also edited. In an interview with Esquire in 2015 Fairey said that Obama had not lived up, "not even close," to his expectations. He continued, "Obama has had a really tough time, but there have been a lot of things that he's compromised on that I never would have expected. I mean, drones and domestic spying are the last things I would have thought [he'd support]." Shepard Fairey, who had created earlier political street art critical of government and of George W. Bush, discussed the nascent Obama campaign with publicist Yosi Sergant in late October 2007. Sergant suggested Fairey create some art in support of Obama. Sergant contacted the Obama campaign to seek its permission for Fairey to design an Obama poster, which was granted a few weeks before Super Tuesday. Fairey has said that his decision to create a portrait of Obama stemmed from Fairey's feeling that Obama's "power and sincerity as a speaker would create a positive association with his likeness." Fairey found a photograph of Obama using Google Image Search (eventually revealed to be an April 2006 photo by freelancer Mannie Garcia for The Associated Press) and created the original poster design in a single day. The original image had the word "progress" and featured Fairey's signature obey star—a symbol associated with his Andre the Giant Has a Posse street art campaign—embedded in the Obama campaign's sunrise logo. 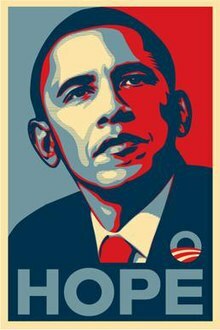 Due to the Obama campaign's concerns about the troublesome connotations of the original wording, Fairey changed the slogan printed under Obama's image from "progress" to "hope." According to design writer Steven Heller, the poster was inspired by Social Realism and, while widely praised as original and unique, can be seen as part of a long tradition of contemporary artists drawing inspiration from political candidates and producing "posters that break the mold not only in terms of color and style but also in message and tone." Fairey has said, "My historical inspiration was the well-known JFK portrait where he is posed in a three-quarters view looking slightly upward and out into the distance. The image of Lincoln on the five-dollar bill has a similar feel." As the campaign progressed, many parodies and imitations of Fairey's design appeared. For example, one anti-Obama version replaced the word "hope" with "hype", while parody posters featuring opponents Sarah Palin and John McCain had the word "nope". In January 2009 Paste magazine launched a site allowing users to create their own versions of the poster. More than 10,000 images were uploaded to the site in its first two weeks. Mad magazine parodied the "hope" poster with an "Alfred E. Neuman for President!" poster. Alfred was on the poster, and the word "hope" was replaced with "hopeless". Anti-Gaddafi protesters in Chicago, in solidarity with the 2011 Libyan civil war, have co-opted the image. Dynamite Comics released a four-part crossover with Obama and Ash Williams of their Army of Darkness comics and the Evil Dead films. One of the issues covers had a picture of Ash Williams (played by Bruce Campbell in the films) in the style of the "Hope" poster with the bottom text reading "Hope?" Fairey was also commissioned to create a number of works in the same style. He produced two other versions, based on different photographs, officially on behalf of the Obama campaign, and another to serve as the cover of the Person of the Year issue of Time. He also created a portrait of comedian Stephen Colbert in the same style, which appeared in an issue of Entertainment Weekly honoring Colbert's television show The Colbert Report. Firas Alkhateeb, the student who designed the controversial Obama "Joker" image, cited Fairey as being his greatest influence. Alkhateeb described the "Joker" image as a corrective to Fairey's glowing portrayal of Obama. Fairey has both criticized and praised the "Joker" poster, stating "The artwork is great in that it gets a point across really quickly", but "I don't agree with the political content of the poster". Conservative satire site The People's Cube made visual and verbal punning images, such as "Chaos" with an image of Rush Limbaugh ("Operation Chaos"), "Shrugged" with an image of Ayn Rand (for her novel Atlas Shrugged) and "Marxism" with an image of Groucho Marx. The September 2009 issue of The Advocate, America's oldest-continuing LGBT publication, featured a cover image similar to Fairey's design. The blue and red coloring was replaced with pink and purple, but instead of "hope", the caption was "nope?". Jon Barrett, the magazine's editor-in-chief, said the cover expressed the frustration among some Democratic members of the LGBT community. The poster has also been parodied in popular culture. In the Futurama episode "Proposition Infinity," a similar poster of President Richard Nixon can be seen, with the slogan "DESPAIR". In the 2010 movie Megamind, a version of the poster can be seen using Megamind's visage and the caption "NO YOU CAN'T", parodying Obama's campaign slogan "Yes we can". Disney's animated series Phineas and Ferb has two episodes, "Nerds of a Feather" and "She's the Mayor", both with Obama's poster parodied with Candace's face. American heavy metal band Five Finger Death Punch has released a version with their mascot and the words "WAR", referring to their album War Is The Answer. In Iron Man 2, Tony Stark receives a similar poster of the Iron Man armor and hangs it in his Malibu garage, much to the displeasure of his assistant and love interest Pepper Potts. The 4th season of BoJack Horseman features Mr. Peanutbutter's version of the poster as he's running for governor. 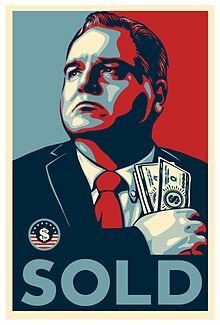 Shepard Fairey created an adaptation of the Obama HOPE poster for satirical Kentucky politician Honest Gil Fulbright. The poster for Honest Gil Fulbright features a portrait of Frank L. Ridley, the actor who portrays Fulbright, with the words "SOLD," which refers to Fulbright's "honest" political message: "I'm only in this thing for the money, but at least I'm honest about it." 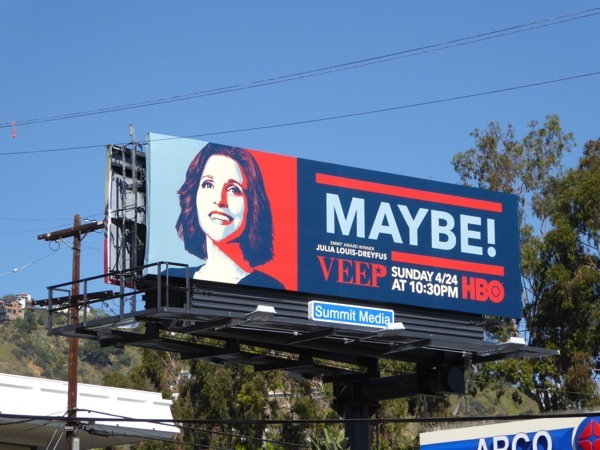 Home Box Office (HBO) created a parody of the poster to promote the fifth season of their satire comedy Veep. The poster was placed on roadside billboards, and other public places to help promote the return. Sympathizing with the Occupy movement, in November 2011 Shepard Fairey introduced a variation of his "Hope" poster. 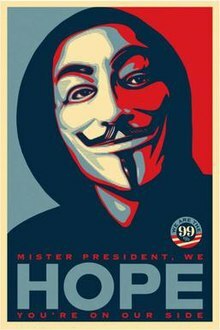 In the new poster, he featured a Guy Fawkes mask, and the message "Mister President, we HOPE you're on our side", with the word "HOPE" in large font and the rest of the sentence in small font. The Obama campaign logo on the right was replaced by a similar logo with the inscription "We are the 99%". In February 2009, the Associated Press announced that it determined "that the photograph used in the poster is an AP photo and that its use required permission" and announced they were in discussions with Fairey's attorney to discuss an amicable solution. Fairey was represented by Anthony Falzone, executive director of the Fair Use Project at Stanford University. Falzone was quoted in the press release: "We believe fair use protects Shepard's right to do what he did here." Fairey subsequently filed a federal lawsuit against the Associated Press, seeking a declaratory judgment that his use of the AP photograph was protected by the fair use doctrine and so did not infringe their copyright. Fairey subsequently admitted that he had based the poster on the AP photograph and had fabricated and destroyed evidence to hide the fact. Fairey's admission came after one of his employees told him that he had discovered relevant documents on an old hard drive. Realizing that these documents would reveal his cover-up, Fairey told the truth to his attorney. Photographer Mannie Garcia contended that he retained copyright to the photo according to his AP contract. He said that he was "so proud of the photograph and that Fairey did what he did artistically with it, and the effect it had," but that he did not "condone people taking things, just because they can, off the Internet." Fairey countered that his conduct did not constitute "improper appropriation" because he had not taken any protected expression from Garcia's original photo. In addition, he claimed his behavior would qualify as a fair use. At trial AP would have to address both arguments. In a separate criminal action, federal prosecutors suggested that Fairey should face prison time for the destruction of evidence in the case, with the government sentencing request stating that "[a] sentence without any term of imprisonment sends a terrible message to those who might commit the same sort of criminal conduct. Encouraging parties to game the civil litigation system [...] creates terrible incentives and subverts the truth-finding function of civil litigation." However, his sentence was ultimately limited to 300 hours of community service and a $30,000 fine. ^ "Copyright battle over Obama image", BBC News, February 5, 2009. Retrieved February 22, 2009. ^ Cohen, Alex (April 7, 2008). "Shepard Fairey Tells Of Inspiration Behind 'HOPE'". NPR.org. Retrieved April 13, 2019. ^ "- The Washington Post". Retrieved March 22, 2018 – via www.washingtonpost.com. ^ David Ng (September 8, 2012). "Shepard Fairey sentenced to probation, fine in Obama 'Hope' case". Los Angeles Times. Retrieved September 8, 2012. ^ Mcdonald, Seven (September 10, 2008). "Yosi Sergant and the Art of Change: The Publicist Behind Shepard Fairey's Obama Hope Posters". laweekly.com. Retrieved March 22, 2018. ^ "Fairey: Obama Didn't Live Up to My 'Hope' Poster". esquire.com. May 28, 2015. Retrieved March 22, 2018. ^ a b c d e Fisher III, William W.; Frank Cost; Shepard Fairey; Meir Feder; Edwin Fountain; Geoffrey Stewart; Marita Sturken (Spring 2012). "Reflections on the Hope Poster Case" (PDF). Harvard Journal of Law and Technology. 25 (2). Retrieved January 21, 2013. ^ a b Gralish, Tom (January 21, 2009). "Found - AGAIN - the Poster Source Photo". Scene on the Road. Archived from the original on January 23, 2009. Retrieved January 22, 2009. 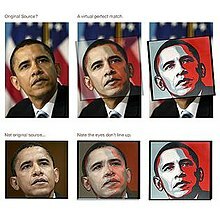 ^ a b c d Ben Arnon, "How the Obama "Hope" Poster Reached a Tipping Point and Became a Cultural Phenomenon: An Interview With the Artist Shepard Fairey", Huffington Post, October 13, 2009. Retrieved January 17, 2009. ^ Steven Heller, "Beyond Red, White and Blue", Campaign Stops Blog, The New York Times, February 15, 2008. Retrieved February 21, 2009. ^ William Booth, "Street Artist Fairey Gives Obama a Line of Cred, The Washington Post, May 18, 2008. Retrieved January 17, 2009. ^ Kate Linthicum, "Artist’s Obama poster spawns wave of parodies", Los Angeles Times, October 8, 2008. Retrieved February 21, 2009. ^ "How you, too, can look and talk like Obama". The Star. Toronto. Archived from the original on October 23, 2012. ^ "Paste's Obama Site Surpasses Magazine's Online Traffic in Less Than a Week - Folio:". foliomag.com. January 19, 2009. Retrieved March 22, 2018. ^ "ABC News". abcnews.com. Retrieved March 22, 2018. ^ Nicole Powers, "Shepard Fairey: Purveyor of Hope", SuicideGirls, December 12, 2008. Retrieved February 22, 2009. ^ Brian Stelter, "Time cover sure looks a lot like a campaign image", International Herald Tribune, December 22, 2008. Retrieved February 22, 2009. ^ Stephen Colbert, "Shepard Fairey", The Colbert Report, January 15, 2009. Retrieved February 22, 2009. ^ a b Good, Oliver (September 1, 2009). "The joke's on who?". The National. Abu Dhabi. Retrieved September 25, 2009. ^ a b Borrelli, Christopher (August 19, 2009). "Talking to the Chicago college student who may be behind Obama-as-Joker poster". Chicago Tribune. Retrieved September 25, 2009. ^ Milian, Mark (August 10, 2009). "Shepard Fairey has 'doubts' about intelligence of Obama Joker artist". Los Angeles Times. Archived from the original on August 12, 2009. Retrieved September 25, 2009. ^ a b Mirchandani, Rajesh (October 10, 2009). "Obama: Letting down gay supporters?". BBC News. Archived from the original on October 13, 2009. Retrieved October 10, 2009. ^ Sullivan, Sean (August 11, 2014). "Why the artist behind Obama's 'Hope' poster is helping a fake candidate". washingtonpost.com. Retrieved March 22, 2018. ^ "Gil Fulbright: Honest Politician". www.facebook.com. Retrieved March 22, 2018. ^ Bell, Melissa (November 20, 2011). "Shepard Fairey asks Obama to support Occupy". The Washington Post. Retrieved November 21, 2011. ^ "NPG Acquires Shepard Fairey’s Portrait of Barack Obama," National Portrait Gallery, January 7, 2009. Retrieved January 17, 2009. ^ "Gallery gets iconic Obama image," BBC News, January 8, 2009. Retrieved January 17, 2009. ^ Tom Gralish, "MYSTERY SOLVED! The Obama Poster Photographer ID'd Archived January 21, 2009, at the Wayback Machine", Scene on the Road, January 14, 2009. Retrieved January 17, 2009. ^ stevesimula, fairey poster photo source?, Flickr, January 20, 2009. Retrieved January 20, 2009. ^ Tom Gralish, "Obama Poster Photo Mystery Archives Archived January 25, 2009, at the Wayback Machine", Scene on the Road, December 22, 2008 through January 23, 2009. Retrieved February 21, 2009. ^ a b Randy Kennedy, "Artist Sues The A.P. Over Obama Image", The New York Times, February 9, 2009. Retrieved February 21, 2009. ^ a b Elliott, Philip (February 4, 2009). "AP alleges copyright infringement of Obama image". USA Today. Associated Press. Retrieved October 10, 2009. ^ Itzkoff, Dave (February 9, 2009). "Shepard Fairey Sues Associated Press Over Obama Poster". The New York Times. Archived from the original on February 11, 2009. Retrieved February 9, 2009. The case is Shepard Fairey; Obey Giant Art Inc. v. The Associated Press, No. 09-CV-1123, S.D.N.Y..
^ Robbins, Liz (October 17, 2009). "Artist Admits Using Other Photo for 'Hope' Poster". The New York Times. Archived from the original on November 14, 2012. Retrieved November 5, 2009. ^ Itzkoff, Dave (May 29, 2010). "Judge Urges Resolution in Use of Obama Photo". The New York Times. ^ "AP and Shepard Fairey announce agreement in Obama poster case". Associated Press. January 12, 2011. ^ "Feds Seek Prison Time For Obama "Hope" Artist". The Smoking Gun. September 5, 2012. Retrieved December 19, 2013. ^ "No Prison Time For Obama "Hope" Artist In Federal Contempt Case, Judge Rules". The Smoking Gun. September 7, 2012. Retrieved December 19, 2013. Fisher III, William W.; Fairey, Shepard; et al. (2012). "Reflections on the Hope Poster Case" (PDF). Harvard Journal of Law & Technology. 25 (2): 243–338. Retrieved December 7, 2012.